One of the best parts about blogging and following fellow bloggers is that you constantly inspire each other. Last month, I was reading a post from STYLISH CURVES about mixing prints and it really made me think for a moment. I realized that although I may do various color combinations, I have never mixed prints. I was intrigued so I took a baby step into trying it out. The great thing about this outfit is that I literally purchased just about every piece off of clearance ranks. I am a huge clearance and thrift store shopper. Sometimes you can score the best pieces if you just take the time to look! So what do you think of mixing prints? Yay or nay? Thanks for reading! God bless. Always a yay! I love mixing prints, esp. leopard and stripes. Looks great. just discovered your blog from For style sake. And i must say, i do love your blog and your style. If you love vintage, please visit my online vintage store, www.coletteClayton.com. Its an online vintage store that carries one of a kind affordable pieces and specially hand crafted tribal accessories. we ship worldwide too. Feel free to shop or spread the word, if you please. definitely yay on prints mixing, but YOUR HAIR IS OH MY GOD FIERCE!!! LOVE!!!! Great style and good taste. 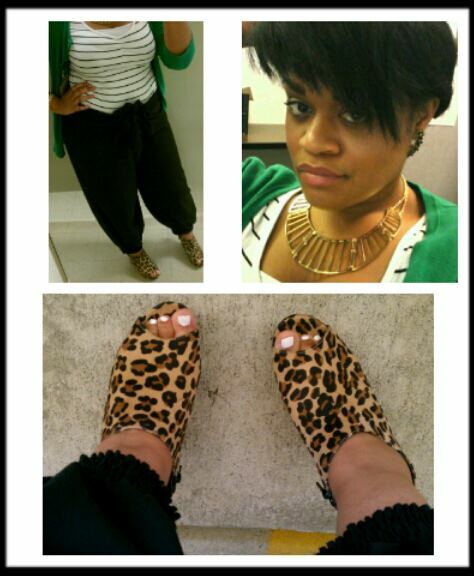 I LOVE mixing prints!!! HAUTEEEEEEE How in the world did I miss this look? Hey, just seeing this. Thanks so much for the mention.